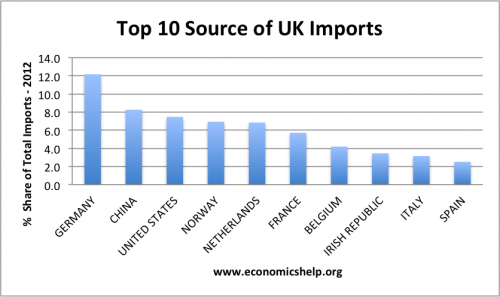 Home > Economics help blog > economics > What does the UK Produce? 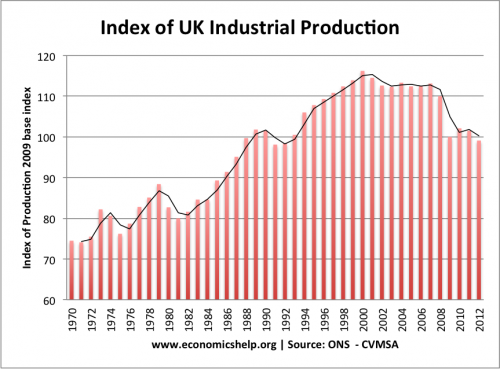 In the post-war period, there has been a relative decline in the size of UK manufacturing. UK manufacturing used to account for over 50% of the size of the economy. Now, manufacturing accounts for around 12-15%. However, although there has been a degree of ‘de-industrialisation’ the UK still produces more in absolute terms than previously. We manufacturer a surprisingly wide range of goods from Nuclear reactors, military equipment, pharmaceutical products to electronics. Many British car firms are no longer owned by British firms. But, in 2011, 1,343,810 cars were produced in the UK BBC. Note: many UK car firms may be owned by foreign companies. Financial services – insurance, banking with London the epicentre. Running services such as air traffic control, train systems. 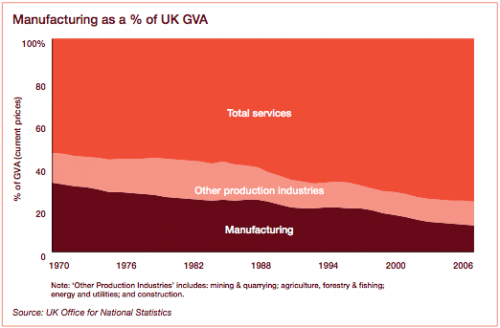 The manufacturing sector has declined from 35% of GDP in 1970 to 12% in 2008.
Who Does UK Trade With? 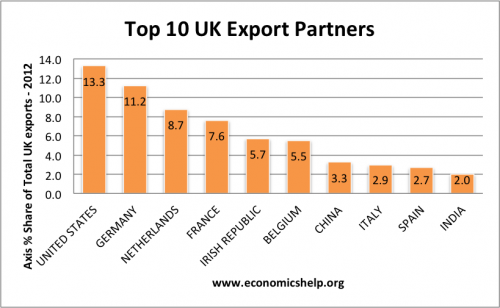 The main source of UK’s trade is with the US and the European Union. China and India are currently a low percentage of overall trade, but given the growth in their economy, this offers the chance for expansion in the future. Industrial and manufacturing output fell significantly in the 2008-12 recession. What did the UK produce in the past? The industrial revolution began in the UK. 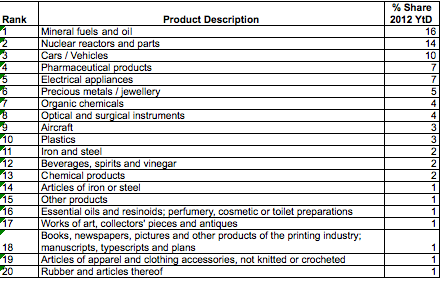 In the nineteenth century, the UK was a world leader in producing key materials associated with the industrial revolution. This mining and manufacturing sector has largely declined. Guessing that some of these will fall away in the future such as mineral oils and fuels, buy hopefully others will make up for this such as automotive where there has been massive investment. I hear so much about the industry losing its importance, but its reading articles like this that really makes me happy. Long may out success continue. Tears, lots and lots of tears.